“Across this frozen lake, I heard a pack of feral dogs howling at the moon,” frontman Matthew Hines croons on the title track of Plague, The Eastern Sea‘s impressive debut. Meditative and poetic, lines like this are characteristic of The Eastern Sea’s style. From start to finish, Plague‘s lyrics are so brittle they feel as though they might break away. This poeticism is matched with the Austin quartet’s sparse instrumentation to great effect. It’s not exactly a sing-along sort of album, but its organic, stripped-down sound is creepingly infectious. Plague is a collection of fragile, emotional tracks that take hold of you and refuse to let go. While some songs boast a fuller sound than the minimalist title track, they maintain a sense of intimacy. “Wasn’t For Love,” one of Plague‘s quicker compositions, plays like an urgent and pained confession — something Hines must get off his chest. “Santa Rosa,” another uptempo track, sounds like a cross between The Shins‘ early work and Explosions In The Sky. Yet The Eastern Sea achieves their greatest success in its spare, delicate tracks like “The Line” and “There You Are.” Icy and isolating, these compositions feel like an intrusion into Hines’ most private of thoughts. 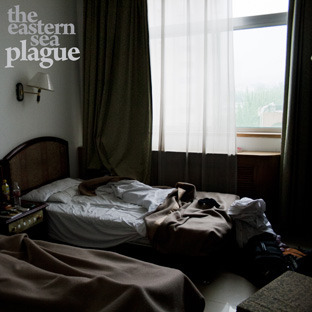 In all, The Eastern Sea’s brittle poeticism is highly inviting, and Plague is a gorgeous album. From Plague‘s icy meditations to desperate confessions, it’s hard to believe this is the Austin four-piece’s first album.